You know how the holiday season is being stretched out longer every year? I mean the halls of retail establishments are decked and it’s not even Thanksgiving. Well, it’s like Christmas has come early, in a manner of speaking, to the red carpet too. Award Season, the glorious period when the best films are released and the greatest actresses shine on the red carpet in amazing jewelry is underway. You may not have noticed things were heating up, but I have been watching the red carpets for us. And let me tell you, it is on! I mean you don’t see the good stuff being pulled out from Cartier and Piaget every day. This is award season finery. To be clear, we might be in what you call a pre-game stage, as none of the nominees have been announced but ballots are going out and the sparkle is turned up. For the premiere of Miss Sloane, a timely drama about a lobbyist in Washington, Jessica Chastain hit the AFI Fest red carpet on November 12 in a Prada gown and Piaget jewels. Chastain, who is a brand ambassador for the Swiss jeweler, is fearless about wearing the strong statement pieces. Her choices for the event from the Extremely Piaget Collection were an 18K pink gold bracelet set with 32 marquise-cut diamonds and 23-turquoise beads and huge 18K pink gold starburst earrings set with 32-marquise-cut diamond and 6 turquoise beads. Her look proved, yet again, turquoise is more than just a summer stone. At a screening for Tom Ford’s new movie Nocturnal Animals on November 11 at the Hammer Museum in California, leading lady Amy Adams wore a black dress designed by the director. She paired the gown with vintage gold Cartier earrings. Made in 1972, the cool jewels must have pleased Ford who is famously passionate about the styles of the period. On Adams’ wrist was a contemporary Cartier design with a vintage vibe. The 18K Gold Amulette de Cartier bracelet is set with onyx, black lacquer and 188 brilliant-cut diamonds totaling 4.85 carats. An odds-on favorite for a Best Actress nom for, well, all the awards of the season is Emma Stone for her role in La La Land. The leading lady kicked off her appearances for the movie at the Venice Film Festival over the summer. You could just tell from the way she glowed in star earrings at the press conference and on the red carpet that she had a confidence about the film. At the AFI screening on November 15, Stone put on a Giorgio Armani Privé black velvet gown and sparkled plenty in diamond earrings by Anita Ko. 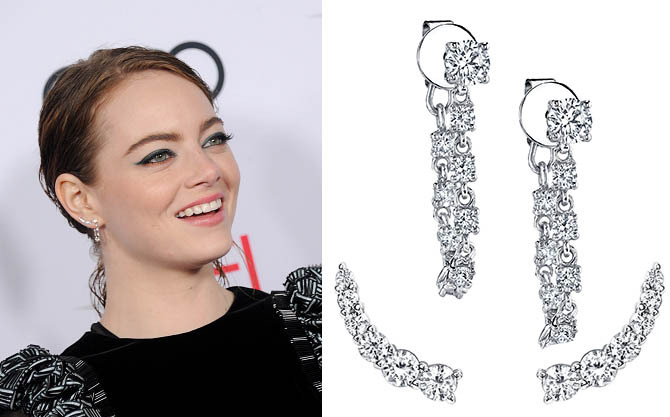 Her jewels included small floating stud earrings and diamond loop earrings. The stunners were in keeping with the way she has been highlighting her multiple ear piercings.